What should I wear to worship God? I dress up to give God my best. I dress casually to make guests feel welcome. I wear what I wear every day because I don't want to be a fake when I come to church. I wear something nice to honor my parents' wishes. I dress so the guys will notice me. I wear what won't lead others to make fun of me. And the list could be a lot longer, but all of those are actual responses I've received when I asked folks why they wear what they wear when they come to worship with other believers. But that wasn't my question. So let me ask the question again: What should I wear to worship God? And this is a very important question because how we answer it tells us a lot about how we understand worship and God and our life as followers of Jesus. But let's get to that question a different way, down a different path. Where was Moses when God called to him in the burning bush and said, "Take off your sandals, for the place where you are standing is holy ground" (Exodus 3:1-5 NIV)? Was he in the Tent of Meeting encountering the holy presence of God? Was he at a time of special worship in Egypt with other of God's chosen people praying for deliverance? Was he on some religious retreat trying to raise up leaders for God's people? Was he with Aaron interceding for God's rebellious people asking for God's guidance? No! He was at work when God said, "Take off your sandals, for the place where you are standing is holy ground." He was in the wilderness doing his job as a shepherd caring for sheep working for his father-in-law. Think about that a minute. Moses was at work when this history changing encounter with Yahweh occurred! His seemingly menial job was the place of divine revelation and one of the Bible's most sacred and memorable moments. And what about Jacob's incredible dream of a ladder reaching up to heaven and the revelation that God was in this place, a place later named Bethel. Was he on some holy mission or in some special time of worship? No, he was on a journey running from his brother and his past after he had stolen his father's blessing through deception with the help of his mother. He was actually camping out, sleeping with a stone as his pillow when this God-sent dream was given to him (Genesis 28:10-17). He was shocked and said, "Surely the LORD is in this place, and I was not aware of it." (Genesis 28:16) He apparently thought God was confined to some special place or some sacred shrine or some group of people, but God was in the middle of nowhere with him, a cheat and a runaway! All of life is sacred space when our bodies are God's holy temple! 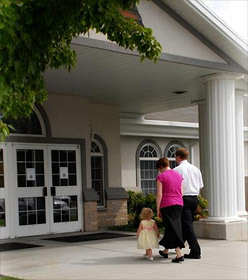 And even when Solomon dedicated the Temple — a place for the glory of God to dwell among God's people — this wise king acknowledged that God was too great to be confined to a place made by human hands or contained by any man made building no matter how great, ornate, or beautiful (1 Kings 8:22-27). And it was Jesus who reminded us of these truths when he spoke to a woman at a well in Samaria and told her that authentic worship is not about place — not on this mountain or in that temple. But true worship is about worshiping "the Father in the Spirit and in truth, for they are the kind of worshipers the Father seeks. God is spirit, and his worshipers must worship in the Spirit and in truth" (John 4:21-24). We've got to reclaim all of life, especially our work, as sacred space! So what are you going to wear to worship this week? We worship just One and we use all of our life to worship him, so we reclaim all of life — our work life, our family life, our recreation life — as sacred space. The Father wants us to love him with all that we have and all that we are (Matthew 22:37-38). He is God of all or he is not God at all. We are to offer him ourselves as a living sacrifice in every area of life (Romans 12:1). We are to submit to his will in holy reverence in our relationships with our spouse, family, and co-workers (Ephesians 5:21) because all of life is our worship where we do all to bring him honor and glory, working to please him (Colossians 3:17; Colossians 3:23). So what should we wear to worship? What we wear to work, at home, at play, and to bed! All of life is sacred space when our bodies are God's holy temple in which he lives by the Holy Spirit (1 Corinthians 6:18-20). So what are you going to wear to worship this week? Will it look something like this? 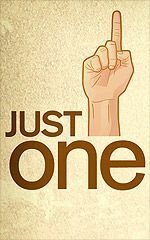 "Living for Just One!" by Phil Ware is licensed under a Creative Commons License. Heartlight encourages you to share this material with others in church bulletins, personal emails, and other non-commercial uses. Please see our Usage Guidelines for more information.